Fort Worth » Blog » Mold Inspection » Know Your Mold! Whether you’re getting a new place, living on your own for the first time, or just can’t figure out what that gross stuff on your wall is, recognizing when you have mold and knowing how to handle it is something we all need to know. If you suspect that you have mold, the first thing you’re going to want to do is determine what type of mold you are dealing with. There is a variety of common household molds. Aspergillus is a very fast-growing mold. Once it gets going, it can spread like wildfire. Although it most commonly appears after things like a flood or a big leak, aspergillus can sprout up wherever there is high humidity and organic material for it to feed on. Cladosporium is frequently found outdoors, but like most other molds can flourish wherever there is dampness and darkness. The presence of cladosporium can be a nuisance in particular to those with bad allergies or asthma as it is an airborne mold. Penicillium is also a common household mold. You are most likely to find this mold on old food. You know the one – it’s that green, white, or blue fuzz that covers the loaf of bread that you forgot you had. Do not, I repeat, do NOT eat that bread! If you do, abdominal discomfort is in your future. On top of that, penicillium’s airborne spores make for congestion, coughing, and runny eyes. This type of mold, although commonly found outside, can grow in carpeting and clothing. It’s more likely to grow in areas that the other molds wouldn’t because it is not as dependent on water. This mold is also known in particular to cause asthma. Perhaps more commonly known as black mold. This mold is often found in drywall and wood that has suffered severe water damage. Black mold spores aren’t known for easily becoming airborne, and it is a fairly uncommon mold. The most dangerous type of household mold would be the aforementioned aspergillus. This is because aspergillus produces aflatoxin, which happens to be a highly deadly carcinogen. It is particularly dangerous for anyone with a weakened immune system to be exposed to aspergillus. However, exposure could cause health problems for anyone. There are all different types of health risks when it comes to mold. It all depends on your exposure as well as your immune system. Ingesting mold can cause gastrointestinal issues. Being exposed to airborne molds can cause coughing, asthma, watery eyes, and congestion. A more severe issue linked to exposure to mold would be respiratory problems. If you think you have found mold in your home, do not ignore it! Prevent ingesting mold by throwing out food before it spoils. Try to prevent too much moisture from making its way into your home. 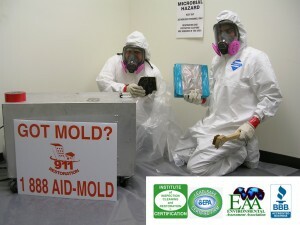 If mold is discovered, the smartest thing to do would be to call a certified mold remediation professional. They will be able to fully decontaminate the area and remove any bad odors that often come with an infestation. Know your mold to keep your home healthy and happy.